And who doesn’t love a little humor and a little snark on this overly commercialized day of love? 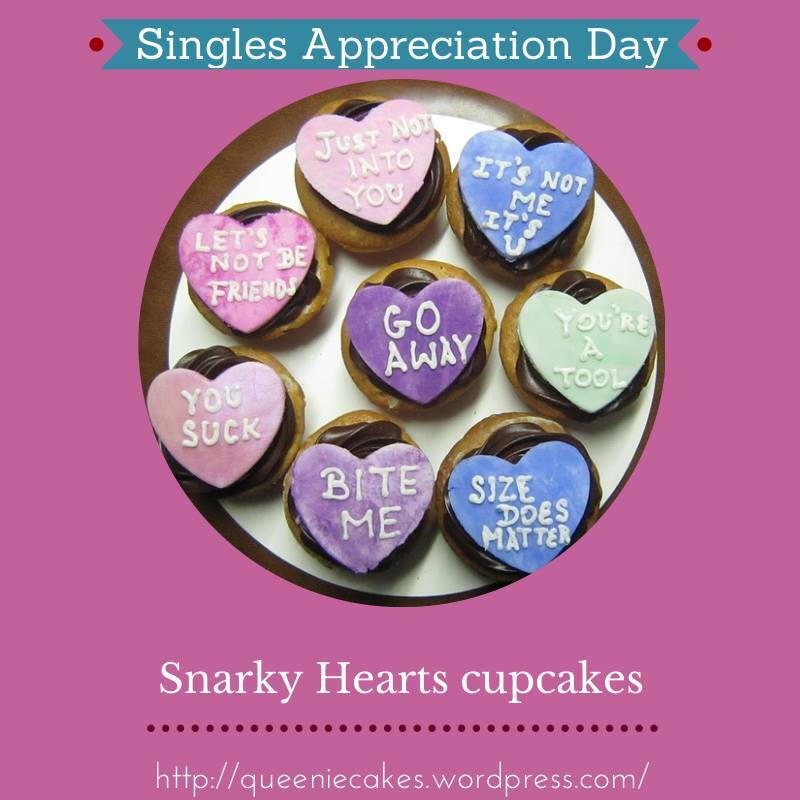 Order your Snarky Heart cupcakes today and celebrate on YOUR terms! The toppers are made of fondant and the lettering is piped with frosting. Do you need these to travel? 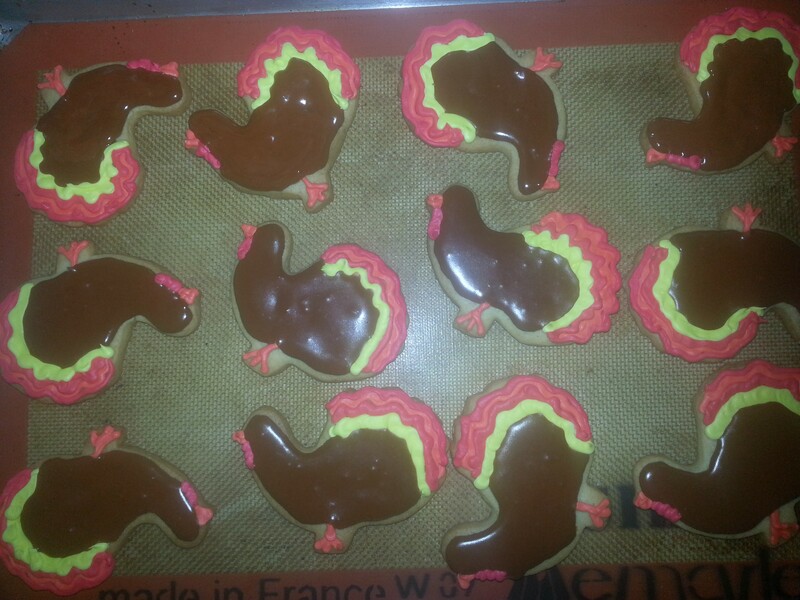 How about a decorated sugar cookie instead? Get your snark in cookie form! Thank you so much to my buddy Terry who fixed a pretty horrible picture and turned it into this pretty display you see below! Thank goodness someone is handy with a photo editing program. I’m usually lost! I know, I know…I should have posted these around November, but the pics were buried in my camera and the holiday season hit the Dungeon hard this year and free time to post was hard to come by. 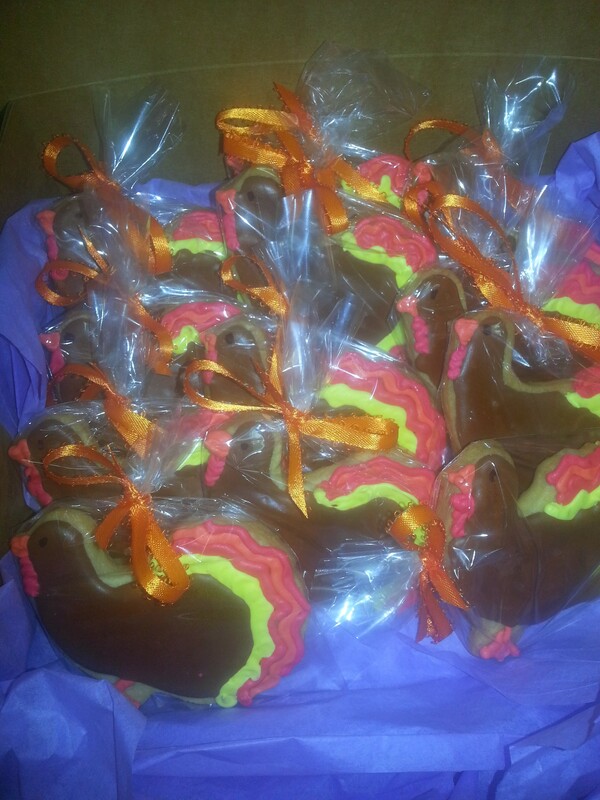 These are 4″ sugar cookies flavored with bits of orange zest and decorated with a citrus vanilla royal icing. They were individually wrapped, ribboned, boxed and shipped down to Florida. And I’m happy to say that they all made it down in one piece. Whew!! A portion of the proceeds from my pie sales this year will be going to the Red Cross to aid in the relief efforts to all those in Tacloban, Philippines who were devastated by Typhoon Haiyan. I will personally match any money raised during my pie sales, so the financial aid is doubled. Although my family overseas are all safe and unharmed, that can’t be said for many other people. This year, although I am thankful for a job, a home, and good health, I am most thankful that I am in a position to help those in need. It would be a travesty not to. Thank you to everyone who has reached out to ask if my family and friends are safe in the Philippines. (They are) But, let’s not forget those who were not as fortunate. I have a wonderful, generous customer base, and I thank you all in advance for your generosity! Southern Pecan– A top seller every year, this bourbon infused pie is pretty, as well as delicious! Pumpkin– No canned recipe here. I puree my own pumpkin and blend it with cream and spices to create this traditional Thanksgiving dessert. I suggest making some cinnamon whipped cream and serving it alongside this pie. Pumpkin Apple – Same as above but with a twist of Apple Butter baked into the custard. Imagine your traditional pumpkin pie with a fruity apple twist in the middle. Coconut Custard– I use a crème brulée base to make my custards. This pie will be richer, smoother, and more decadent than anything you’re going to buy in some other bakery. Apple– Between two crusts or crumb topped, this has been my baby since the beginning. With a sweet cinnamon-spiced crust and a distinct center, my regulars order this type from me year after year. Yes, I know it’s ballsy to take this traditional Italian dessert and transform it into a pie, but if anyone can do it right, it’s me. My tiramisu base is legendary. I’ve found a way to transform that into a pie. With a “crust” of soaked lady fingers and a tiramisu filling, this sinfully new pie is topped with a dusting of only the finest Dutch processed cocoa powder. Give it a try; you may want one for X-Mas, too! You’re seen it on Pinterest, and have been tempted….But here it is! What is it, exactly? My version has a chocolate Guinness crumb crust, fresh bananas on the bottom, a drizzled layer of toffee and a light and airy coffee flavored whipped cream. It’s garnished with dark chocolate curls. It’s sweet. It’s probably fattening. But, it’s delicious! People have been asking for it for years, and I’ve politely skirted around the whole peanut butter thing because I’m not a peanut-lover…but a lot of my customers are! A little tinkering with the traditional recipe has left me with a nice, fluffy peanut butter chocolate mousse that even I wouldn’t mind taking a slice of. This pie is in a baked chocolate crust. The filling is a whipped, fluffy light peanut butter chocolate mouse that would make any Reeses-lover happy. Just a little sampling of some of the Xmas cupcakes going out this season! 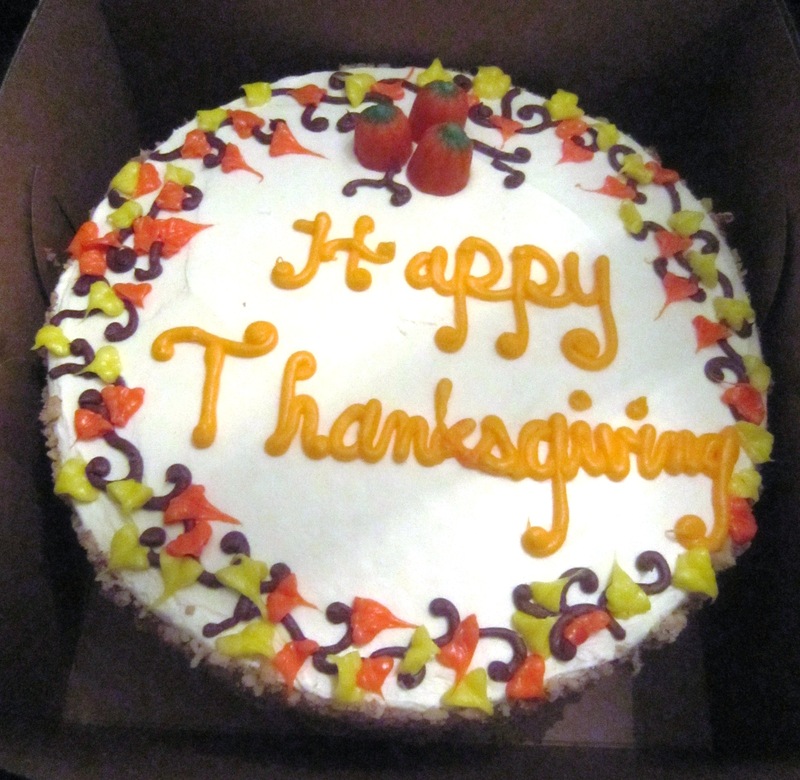 Our 2010 endeavors proved fruitful this year with many pies, cookies, cupcakes, and cakes baked and delivered; gracing various Thanksgiving tables here in NY and other states, as well. I could not be happier with the results. The only thing more heartwarming were the beautiful compliments sent back after the feasts were done. 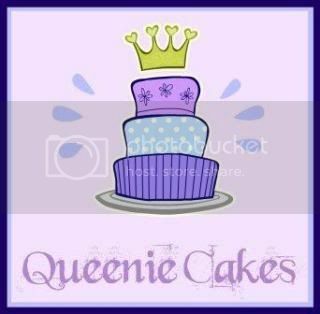 Thank you to my fantastic costumers; old and new who gave Queenie Cakes an honored spot on their holiday tables this year. This little baker couldn’t be more pleased! 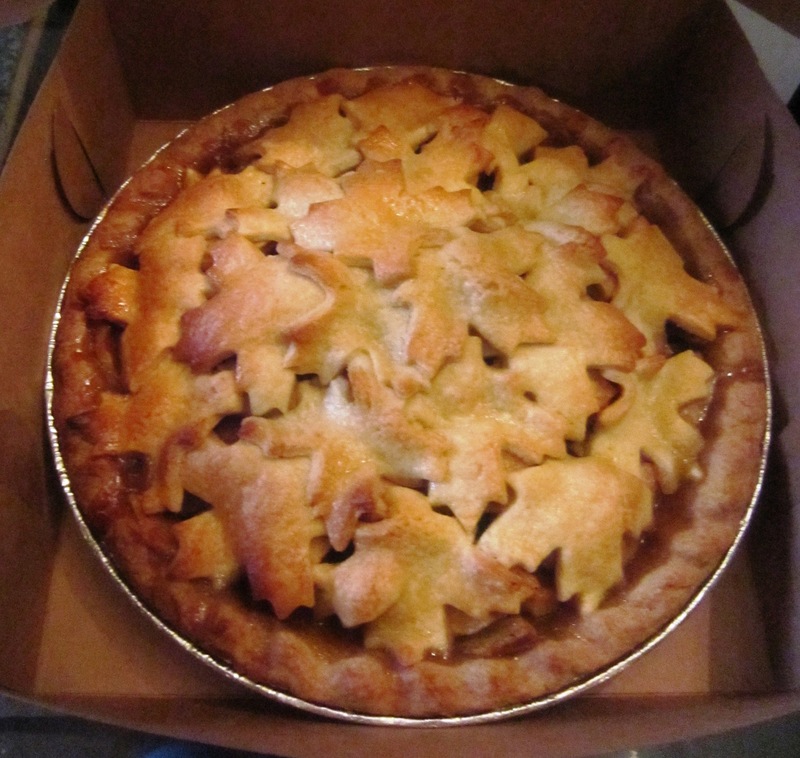 I’ve been baking Thanksgiving Pies for sale for the last ten years. Over the years, I’ve had some fantastic flavors that have done well, and others that sort of fell short. These are the one’s I’m showcasing this year. I always take special requests, so feel free to ask if you have a flavor that may not appear on this year’s list. A 10″ Pie is going for $15.oo this year. 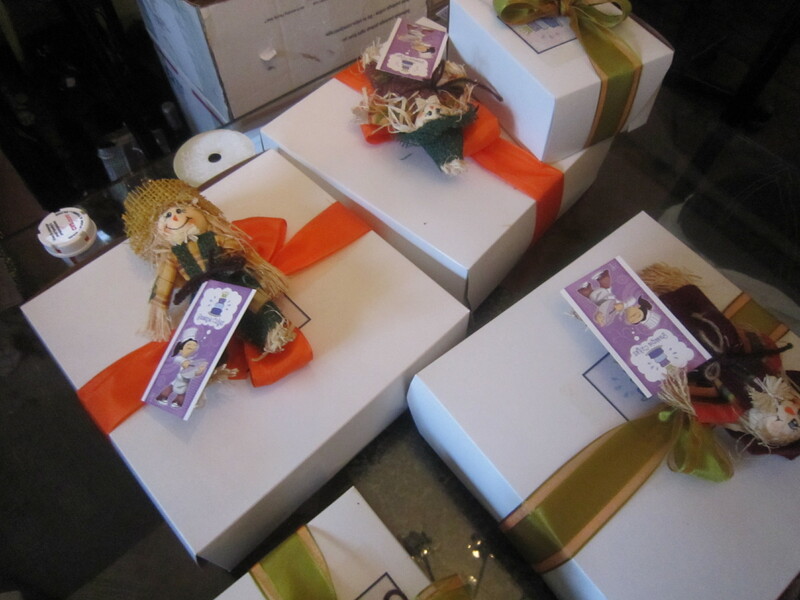 Besides one AWESOME pie, it will be boxed and wrapped- ready to take anywhere you end up for gobble-gobble day. The box will be beautifully ribboned and decorated; dressed and ready to set out on your own table or to head out wherever you may be celebrating. Because I’m still working out of a smaller kitchen, I do have a cap I must set this year to ensure fantastic quality and timely delivery. Once I hit the 200 pie pre-order limit, I will not be able to take any more orders. I don’t want to risk your pie not being finished in time for the big day. I know some people need theirs a little earlier, and that’s fine, too. Just refrigerate and set out at least an hour or two before serving. Baked pies can be warmed in a 300 degree oven for 15 minutes before service. I also offer Carrot Cake Cookies– which are soft cake-like cookies sandwiched Oreo-style with a filling of cinnamon cream cheese frosting in the middle. A box 0f 16 is only $10.00. Email me, and I will email you my phone number so we can talk in person if necessary. As always, questions and special requests are always welcome!